Spoleto Study Abroad had an adventurous first full day in Italy! We spent the day exploring Assisi, the town most commonly known for St. Francis and St. Clare. Andrea Muti, the students' Italian instructor and tour guide, did a wonderful job teaching us about the history of Assisi. The first place that we visited was Rocca Maggiore, a grand castle that dates back to the Twelfth Century. It is perched atop a walled hilltop overlooking the city of Assisi and surrounding countryside. Students were able to explore the castle and enjoy it's beautiful views. 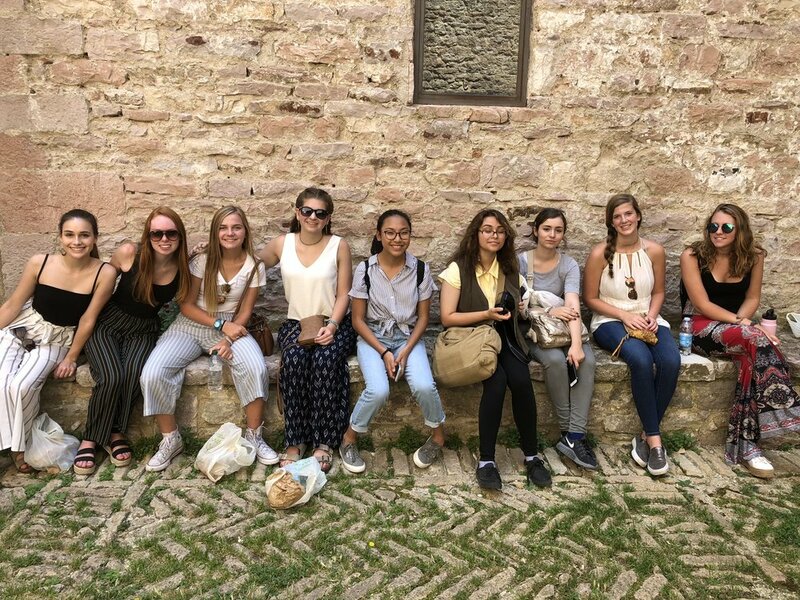 Students outside the Rocca Maggiore in Assisi, Italy. After our visit to Rocca Maggiore, we ventured down to Temple of Minerva, an originally ancient building. It has since gone through a lot of change since it was built, and it currently houses a church, Santa Maria sopra Minerva - which translates to Saint Mary above Minerva. Students then had an opportunity to explore Assisi. Many of them went and got pizza, gelato, and found some unique souvenirs. To finish off our day in Assisi, we toured the Basilica of Saint Francis of Assisi. To finish off our day together, we enjoyed a delicious three course dinner. We started with pasta with fresh vegetables, then moved to steak or cheese with roasted potatoes, and finished with gelato. Overall, it was a great day! Tomorrow we will be seeing some of the wonder in Spoleto and having our first day of discipline classes.